tilted, originally uploaded by jahansell. The first of a few more photos of Pine Hill Farm. After that I can start taking my gentle readers up on their wonderful suggestions! But - Tony, can you give me a few more details on how I'll find your house? Doesn't that tiger lily peeking in on the right of the photo contrast yet accentuate the more "industrial" scene. It is a very interesting photo. I wonder what all the five gallon buckets were used for. I'm hesitant to post the actual address. Email me at TonyJ3@gmail.com and I'll send you the address. I love this photo. 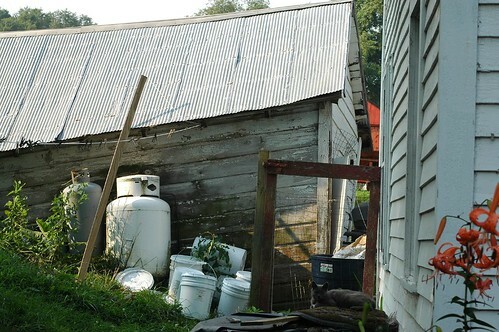 It reminds me of a shed on my grandmother's farm.